Brain Injury Medicine - which includes free ebook access with every print purchase - is a clear and comprehensive guide to all aspects of the management of traumatic brain injury-from early diagnosis and evaluation through the post-acute period and rehabilitation. 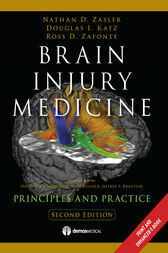 An essential reference for physicians and other health care professionals who work with patients with brain injury, the book focuses on assessment and treatment of the wider variety of clinical problems these patients face and addresses many associated concerns such as epidemiology, ethical issues, legal issues, and life-care planning. Written by over 190 acknowledged leaders, the text covers the full spectrum of the practice of brain injury medicine including principles of neural recovery, neuroimaging and neurodiagnostic testing, prognosis and outcome, acute care, rehabilitation, treatment of specific populations, neurologic and other medical problems following injury, cognitive and behavioral problems, post-trauma pain disorders, pharmacologic and alternative treatments, and community reentry and productivity.